Great, thanks for the new version!. People complaining should actually take a few seconds to read the installer. 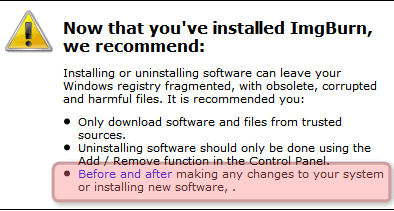 Blindly pressing the "Next" button means ImgBurn is the least thing to worry about when they're installing software. Also, since they're not paying for it, they have nothing to complain about... not to mention that it's still better than Nero requiring gigabytes of HDD and RAM to do the same thing... that's what I call bloated. Obviously there is a lot of folks using IB, you can see that by just looking at the DL counters. The real sad thing is taking flack from folks who probably never donated to you at all. You know I have and will always support you. IB is the BEST burn engine on the planet, bar none. This is just a thought, you can throw it in the wastebasket, but I thought r0lZ's idea was a good one to get folks donating for using PgcEdit. Not sure how it has worked out for him, I would have to email him an ask. Pretty sure I'm not the only one who feels you should get compensated for all your hard efforts for creating and future development of ImgBurn. Shoot, I'm unemployed, but when I get done with this post, I'm gonna go push that donate button. Gonna send r0lZ some funds too. It won't the $ figure I normally donate, but i'll be more that $2. Shoot half that $2 you ask for gets eaten by PayPal, right. I know I should stop by more often, but you don't need me cluttering up the book shelf. You have such a great group of folks helping you with support already, i.e. spinner, corny, dontasciime, volvo, lfc, Blu, Cynthia, db, Chewy, polopony, Shamus, kevd, etc. please forgive me if I forgot any of my ole friends. BTW: Is there a way to incorporate using the Queue for Build mode ? Not sure if it's this option to add images to the write queue you are looking for. Thanks for the reply Cynthia, take a look here for a little more info on what I'm trying to accomplish. Sad to see the Ask.com Toolbar, but it's just a few checkboxes to look out for. Yeah. Just strange that it still tries connect to the internet before coming to those checkboxes! I extracted the files without installing. ImgBurn looks the same as before. Thank you for all the work on this new version. I am wondering if this new version has multi-session burning. What I mean is: If I burn some files to a CD, can I leave the CD open and go back later an add some more files to the same CD? I have been hearing for some time that this feature would come in a future version. If not now, when might I expect this feature? Yeah, I have been waiting for that to be implemented forever. I just use Nero and Joonas drag and drop plugin for winamp so I can add files easier. Sentence is not whole... Something is missing at the end. Love ImgBurn, I had no problems. I just opt-out of everything I wasn't interested in. I didn't install first few days of new release so my experience maybe different. I believe the AskInstallChecker 1.4.0 did "phone home"
With all the "real" changes it's a great update. Now I can reduce my other building/reading/writing applications to nearly none. ImgBurn is doing most duties, rightfully so. I would rather have a bit of boxes to check and not to check than not to have future updates. I have been out of work and unable to donate for about a 18 months or so. LUK, I know you've heard a lot from me, and are probably sick of hearing about Ask Toolbar complaints, but I'm done complaining about Ask already. As long as the installer is modified in the future, to avoid key/click-buffering bugs (causing it to progress and install Ask due to the delay in loading the page, without actually asking)... then I've got no more beefs with that. But hear me out here regarding the affiliation with Uniblue software. I'm a computer repair tech at a relatively busy shop. I see all the computer problems first hand, I see what causes them, and I'm the guy that ends up fixing them most of the time as well (in which case another tech follows my prescribed repair/cleanup techniques). With that said, Uniblue software is absolutely freaking evil. In fact, it's flagged as malware in some of the better products (like Microsoft Security Essentials, which we install here). Every now and then we get a computer in the shop that's used one of Uniblue's products, or some from other vendors. And time and time again, Uniblue software has been responsible for pretty much entirely hosing the person's computer, and/or scamming them out of $30-60 for junk software that does nothing. Driver updating is not something that can be done automatically - EVER. The reason being, there is no central repository for drivers versus hardware IDs, so these programs cannot even function in any usable capacity to begin with. The very best they can do is match a certain set of common components with generic driver packages that the company maintains themselves. Far from covering every piece of hardware (as a "driver updater" should do), and far from being accurate - for example, it would toss out Sony's custom nVidia driver and throw on a hacked/generic nVidia driver, disabling all sorts of Sony's proprietary features and functionality. So... please, LUK. You might have had good intentions in mind, thinking you can help people out and make a few bucks on the side in the process, but in reality you're doing FAR more harm than help here. Anyone that downloads these tools per the site's suggestion, is just in for a world of hurt. This is far beyond just "don't click it then!". That would apply to me, and I'm not dumb enough to sucker into those things anyway. This is extending to every person out there who doesn't post on the forums, doesn't know ImgBurn's long and clean history, and is downloading ImgBurn because their friend told them it's awesome. When their computer comes into our shop because it got infected with Uniblue malware... it won't be anyone's fault but ImgBurn for pointing them there.